Bug Tracker is an a Bug Tracking System that allows users to track and record bugs and issues during software development cycle. With our advanced user right control, users are given access only to projects they need to work on. Start to use our bug tracker right now, Bug Tracker makes your project development more efficiently by tracking bugs, and this will result in faster response and support for your customers. This tool lets you know how many bugs are in process, how many are resolved and how many are closed. It records bug report in database and allows simultaneous access by different users. Bug Tracker also offers bug classification, auto and manual task assignment, sorting, fully customizable filter, attachment, flexible right control, auto login and more. Bug Tracker 2.9.1 also support task functionality, through which you can add tasks and assign tasks to your team members. · Easy to use and maintain. · Task function, enable you to create new tasks and assign them individually to users. · Create new bugs along with report, recreate step and workaround. · Flexible user right control. · Quick search enables you to find your records fast and easily. · Automatic or manual task assignment provides more flexibility. · Attach files to bug/features. · Support multiple projects in one database. · Powerful filter tool with And, Or operators and wildcard text search. · Print/Print preview in simple and customizable mode. · This version allows you to only add 50 records in the database. You cannot download any crack or serial number for Bug Tracker on this page. Every software that you are able to download on our site is legal. There is no crack, serial number, hack or activation key for Bug Tracker present here. Our collection also doesn't contain any keygens, because keygen programs are being used in illegal ways which we do not support. All software that you can find here is freely downloadable and legal. 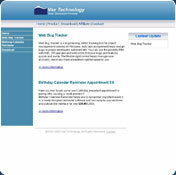 Bug Tracker installation package is prepared to be downloaded from our fast download servers. It is checked for possible viruses and is proven to be 100% clean and safe. Various leading antiviruses have been used to test Bug Tracker, if it contains any viruses. No infections have been found and downloading Bug Tracker is completelly problem free because of that reason. Our experts on malware detection tested Bug Tracker with various spyware and malware detection programs, including fyxm.net custom malware and spyware detection, and absolutelly no malware or spyware was found in Bug Tracker. All software that you can find on our servers, including Bug Tracker, is either freeware, shareware or open-source, some of the software packages are demo, trial or patch versions and if possible (public domain licence), we also host official full versions of software. Because we want to be one of the fastest download sites on the web, we host all the software including Bug Tracker on our servers. You cannot find here any torrents or download links that would lead you to dangerous sites. Rate Bug Tracker 2.9.8 b596!